What are Different Types of Shellfish Poisoning? 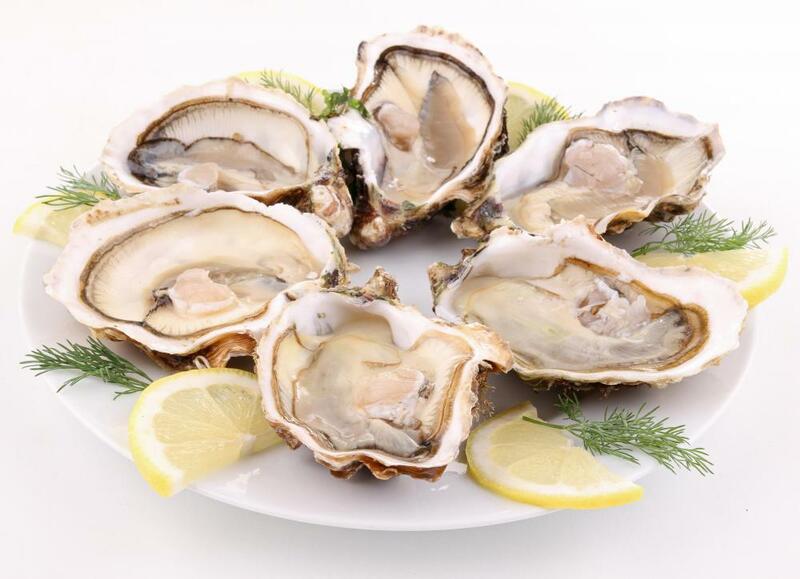 Oysters can contain saxotoxin, which causes paralytic shellfish poisoning. 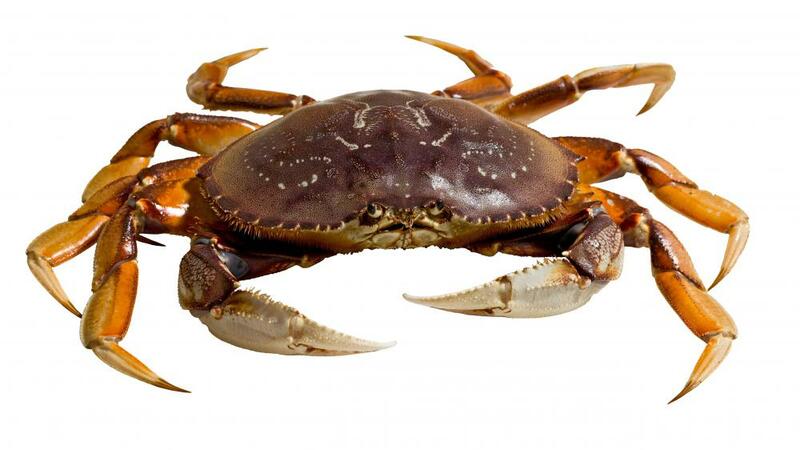 Amnesic shellfish poisoning (ASP) is a very rare disease caused by a toxin sometimes found in Dungeness crab. Vomiting may be a sign of shellfish poisoning. 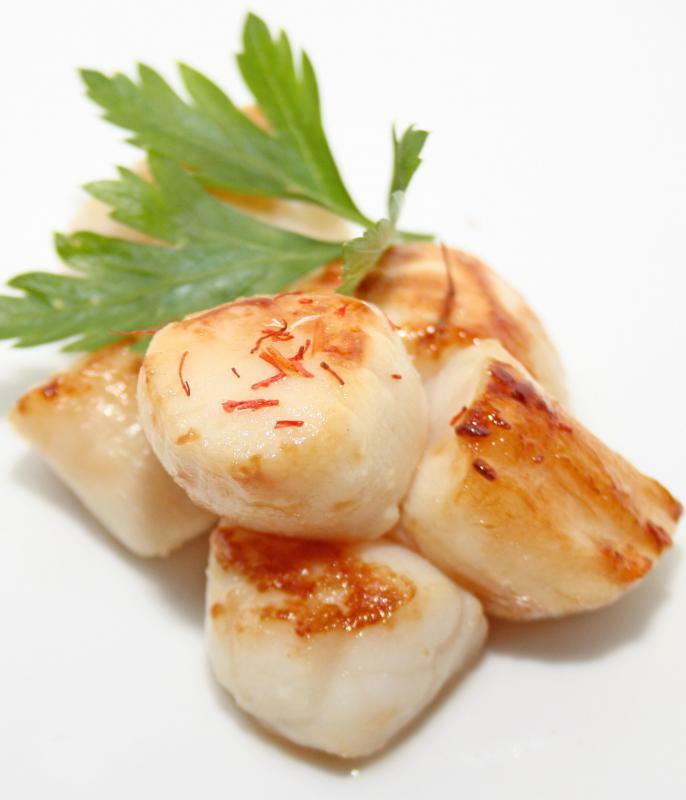 Cooked scallops, a type of shellfish. 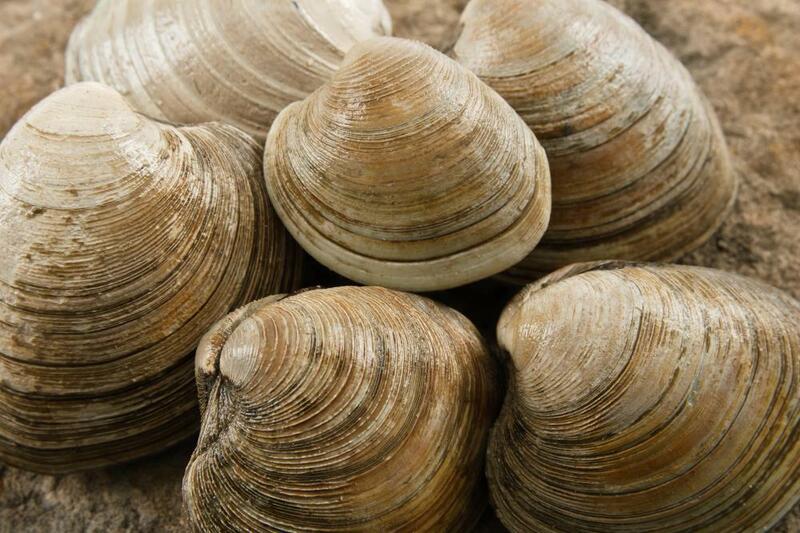 Clams, a type of shellfish. 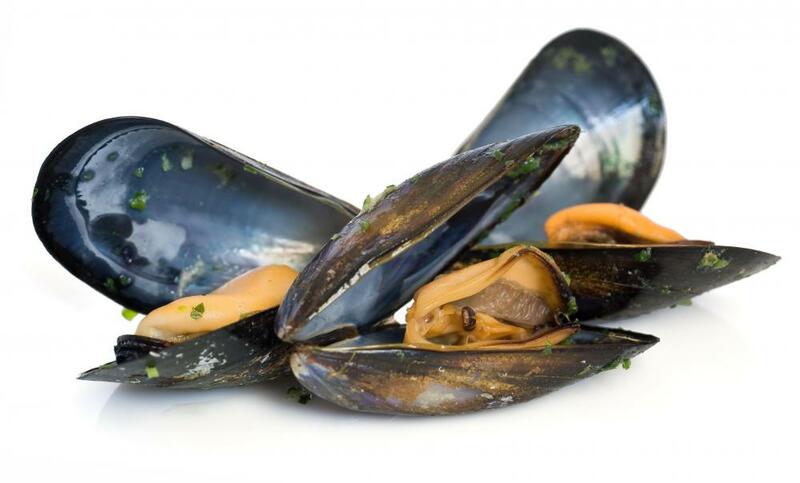 Mussels, which can cause shellfish poisoning. Shellfish poisoning is caused by toxins that enter the shellfish in the water before harvesting. Poisoning from shellfish less common than shellfish allergies, which can also harm or kill a person. The diseases caused by shellfish toxins are paralytic, neurotoxic, diarrheic, and amnesic in nature. Careful observation of the shellfish environment can help prevent the infected shellfish from being used for human consumption. Paralytic shellfish poisoning (PSP) is caused by a toxin released by algae, and is found in bivalves. Symptoms begin within minutes of consuming the infected shellfish, and include headache, dizziness, tingling, nausea, vomiting, and diarrhea. Muscle weakness can make swallowing difficult, and can even impair breathing. Particularly at risk are patients who require a respirator for breathing every day. Vomiting may be induced if the patient is not too weak, and symptoms usually subside in six to twelve hours. Diarrheic shellfish poisoning (DSP) is caused by toxins produced by algae. Like PSP, it is typically found in bivalves. Symptoms begin immediately after ingestion, and include severe diarrhea and abdominal pain. Treatment is supportive, and symptoms subside within one to two days. Death rarely occurs, and if it does, it is due to dehydration. Neurotoxic shellfish poisoning (NSP) is also found in bivalves. Symptoms occur from one to three hours after ingestion. These symptoms include numbness and tingling of the face, mouth, and extremities, reversal of hot and cold sensation where hot substances feel cold and cold substances feel hot, and loss of coordination. Mild to moderate digestive symptoms also frequently occur. Treatment is supportive. No deaths have been reported due to NSP. Amnesic shellfish poisoning (ASP) is a very rare disease caused by a toxin found most often in mussels, clams, and dungeness crabs. Symptoms occur about 24 hours after consumption and include abdominal pain, vomiting, diarrhea, headache, heart palpitations, and short-term memory loss. Seizures, coma, and death can occur in cases of severe poisoning. There is no cure, and treatment is strictly to provide comfort to the patient. The toxins that cause shellfish poisoning have no odor or flavor. They are not destroyed by cleaning, cooking, or freezing. Careful testing of the water near shellfish beds is important to avoid poisoning in humans. Since these toxins are produced by marine plants most frequently in summer and early fall, avoiding shellfish at these times will reduce the risk of ingesting them. How Common are Fatalities from Food Poisoning in the US? How do I Know if I Am Allergic to Shellfish? What is Neurotoxic Shellfish Poisoning? What is Amnesic Shellfish Poisoning? I had mussels for dinner with my father. He's healthy as a horse, but I'm sitting here shaking and projectile vomiting. This is the second time in the past month that I've gotten a bad tasting clam and then five or six hours later got sick. We've eaten about six packs of these in the last two months, so that means that one out of every three batches contained a bad clam, that I just happened to eat. Don't get me wrong; I'm glad he's not the one sick because he's significantly older than I am and would be worse off! But why did I have the luck to get both of them? No more mussels for me! Ever! I don't think I have any of these shellfish poisons, but the other day, my mother had made cod and mussels for dinner. I personally love mussels and think they are such an interesting food. When I ate my second mussel, I noticed it had quite an interesting taste and it was quite hard, too. It was off the shell, but to me it didn't really matter. Now two days later I'm still lying in bed, I feel like the whole world is spinning and I'm freezing cold and nothing seems to make me warm. I've also vomited quite a few times after I've eaten something but my question is, do I have some kind of shellfish poisoning? @JaneAir - I would hate to get food poisoning on a romantic vacation! How awful. I'm personally a little disturbed by the fact that cooking doesn't get rid of these toxins. I think I'm going to rethink my shellfish habits from now on. I live in a state where crabs are extremely popular and honestly, I'm surprised I haven't heard of more people getting sick from shellfish poisoning! I don't like shellfish, and after reading this article I'm kind of glad! Shellfish poisoning sounds positively horrible. My mom suffered from shellfish poisoning from a lobster after her and my dad first got married. They went on a romantic vacation and went out to a nice, quiet dinner. A few hours later, my mom was sick as a dog. She's never eaten a lobster or any other kind of shellfish again and I don't blame her! @runner101 - I have not had to use an Epipen, but my mother-in-law is having a curious problem. One night her throat closed up, and an ambulance was called. The only thing they could possibly link to her throat closing up was the fact she ate shellfish earlier. The thing was she has never ever had a problem with shellfish before. Her doctor also gave her an Epipen because it sounded like an allergy, but then her throat closed up again! Since then she has she has seen specialist after specialist and no one has figured out the problem. The possible diagnosis range from complication of her Chronic Obstructive Pulmonary Disease (COPD) to a side effect of gastrointestinal reflux (GERD) possibly mixed in with her COPD. We will keep looking for answers but were curious if anyone else has had this problem. I may be pressing my luck, but I have never been sick from shellfish, but I have heard stories about it! I had one roommate who had gotten sick from it, and to get relief quick her doctor (who also happened to be her sister) wrote a prescription for an enema. Although seemingly frightening by name, the enema was worth it, as she finally felt some relief. Has anyone else had a allergy to shellfish that required use of an Epipen? My best friend suffered from amnesic shellfish poisoning. She ate the dungeness crabs at our favorite seafood restaurant, and that meal choice changed her life forever. She had always eaten seafood with no problems in the past. It is very unfortunate that this time would be the exception. Over a period of three days, her symptoms went from slight dizziness and diarrhea to confusion and seizures. I saw her have a seizure, and I took her to the hospital. Her doctor said that the damage to her brain was permanent. She would have trouble with her short-term memory for the rest of her life. The first thing I noticed was that my lips and tongue were tingling. Then, my arms and legs started to burn. Nausea hit me like a rogue wave, and I began vomiting. I had bad cramps and diarrhea. I began to feel like I might choke, and it got hard to swallow. Since my immune system was normal, I was able to recover in a day. I really felt like I might die for awhile there. After years of fear, I took the plunge and ate some oysters at a nice restaurant. I actually liked the taste, but the slippery texture threw me off a bit. The flavor enticed me to eat about ten of the things. About 45 minutes after eating them, I got the worst abdominal cramps I have ever experienced. I had to pretty much camp out in the bathroom, because the diarrhea was so severe. I had to keep a trash can by the toilet to catch my vomit. I sat there shaking from chills. I knew that I had shellfish poisoning, because my friend who ate with me had gotten it years ago from oysters. Our symptoms were identical. She told me it would go away on its own in three days. I took medicine to manage the diarrhea, and I consumed lots of water to avoid dehydration. I will never take a chance on eating oysters again. While on vacation to the Gulf Coast, I got neurotoxic shellfish poisoning after eating some delicious shellfish at a seaside restaurant. The meal was so succulent that I never would have guessed it contained toxins. About two hours after I ate, I was walking on the beach when I suddenly felt my mouth, cheeks, and hands start to tingle. I began to stumble around, and my husband helped me to the hotel room. He gave me an ice pack for my forehead, but to me, it felt hot. I became very nauseated. It was the sickest I have ever felt. It is quite scary to learn that you can't really tell if your shellfish is carrying a poison or not. I always thought that shellfish was pretty safe but after reading about the kinds of poisoning that can happen I am not really sure. Has anyone ever had shellfish poisoning? How did you realize that it was the shellfish that had made you sick? Was it an easy recovery or was it hard to pull through? I really think after reading this article that I am going to avoid enjoying shellfish during the summer. It just doesn't seem to be worth the risk. How do you know if you are suffering from shellfish poisoning or a severe allergic reaction? Are there are any unique symptoms to shellfish poisoning? A few years back I had some clams and I got quite ill afterwards. I was dizzy and had trouble breathing and only taking a ton of allergy pills and drinking water made me feel any better. Ever since I haven't touched any shellfish, but am really curious if it was a one time case of poisoning or if I am really allergic. My doctor said it sounded like I had an allergy so I was given an Epipen. I have since had some crustaceans and have not had any adverse side effects. It is really making me question what happened that day.